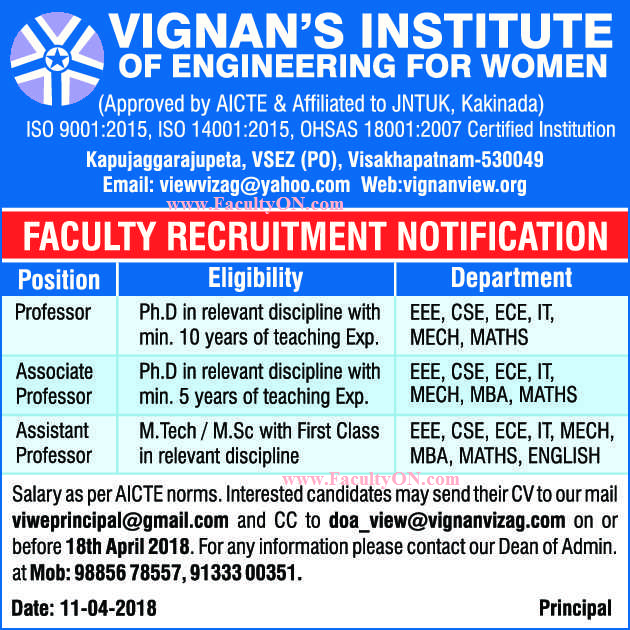 Vignan's Institute of Engineering for Women, Visakhapatnam has advertised in THE HINDU newspaper for recruitment of Professor / Associate Professor / Assistant Professor jobs vacancies. Interested and eligible job aspirants are requested to apply on or before 18th April 2018. Check out further more details below. About College: Vignan’s Institute of Information Technology (VIIT) was established in 2002 in the City of Destiny, Visakhapatnam, to cater to the educational needs of the general public. The experience gained by Vignan through its earlier institutions at Guntur has only helped in establishing very high quality standards right from the inception and also is one of the reasons for the success of the present institution. VIIT aims to produce globally competent engineers who are socially conscious, emotionally balanced and psychologically strong. success of the present institution.